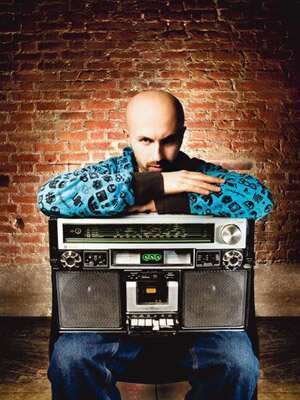 Hip hopper: Wax Tailor brings an emotional note to the genre. 10.30am-4pm. DakshinaChitra, Muttukadu, East Coast Road (9841777779). Fees, Rs500, inclusive of material, transport (pick-up and drop at Madras Craft Foundation, Adyar) and refreshments. Cream Centre presents an array of north Indian parathas, some with an international twist. Choose from whole-wheat- or roomali-based ones, filled with the traditional radish and potato. Or if you care to experiment, there is Nutella paratha, a Double Decker Paratha with a combination of cheese and vegetables, and the Chinese-style Spring Veg Paratha. 11am-3pm and 7-11pm (weekdays) and 11am-11pm (weekends). Cream Centre, 45, College Road, Nungambakkam (43561777). Charges, Rs156-189. 7pm. Bucks Theatre, YMCA, Nandanam (28279803). Singer Jayashri Vaidyanathan will present her favourite bhakti songs, followed by a violin duet by Sangita Kalanidhi M.S. Gopalakrishnan and M. Narmada. The duo will be accompanied by Neyveli Narayanan on the mridangam. 5pm onwards. 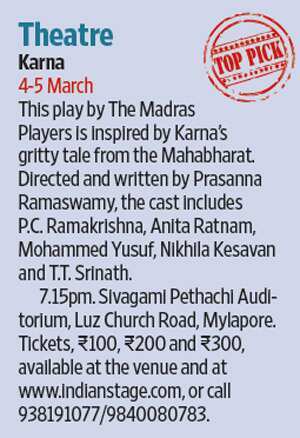 Hamsadhwani, 2, 8th Lane, Indira Nagar, Adyar (24915555) Tickets, Rs100, Rs200, Rs300 and Rs500, available at the venue. On the occasion of Women’s Day, Prakrit Art Gallery will bring together the best works by leading women artists, including Arpana Caur, Rini Dhumal, Seema Kohli, Lalitha Lajmi and Manisha Raju. 11am-7pm. Prakrit Art Gallery, 102, Greenways Road Extension, RA Puram (42188989). 8pm. Hard Rock Café, Bombay Dyeing Mills Compound, Pandurang Budhkar Marg, Worli (24382888). Tickets, Rs500. Angelique Kidjo, from Benin in west Africa, has spent two decades entertaining and delighting fans around the world. The 51-year-old artiste’s latest album Oyo is an an exhilarating survey of the vocalist’s deepest influences. Amid the innovative reinterpretations of tunes by James Brown, Santana and Miriam Makeba on Oyo is a Congolese-tinged version of a classic from the 1950s—Mohammed Rafi’s Dil Mein Chhupake Pyar Ka Toofan. Kidjo will perform songs from Oyo at her Mumbai gig. 10pm. Blue Frog, Todi and Co., Mathuradas Mills Compound, opposite Empire Mills, Tulsi Pipe Road, Lower Parel (40332300). Tickets, Rs2,000. The Indian Council for Cultural Relations is organizing a Rajasthani group dance performance by the students of Rupal Barot’s Roop Kala Kendra, which specializes in the folk dances of Maharashtra, Gujarat, Rajasthan and Punjab. Five dancers from Barot’s institute will present ghoomar (a dance in which women pivot continuously and demonstrate the flow of the gorgeous ghagras, or skirts), thali (wherein the dancers dance on and with a plate) and bajoo bandh (a style that has been named after the armlet). 6.30pm. Little Theatre, National Centre for the Performing Arts, NCPA Marg, near Hilton Towers, Nariman Point (66223737). Eight individuals gather at the American Center and gear up for a fight. The prize: a handshake with the US president. A pastiche of stereotypes, the contestants range from a stockbroker who can only think in terms of money to an IT professional who tries to conceal his homosexuality by aggressively displaying his mathematical prowess. Directed by Kunaal Roy Kapur and written by Anuvab Pal, the play stars Kunaal Roy Kapur, Shivani Tanksale and Namit Das. 2 hours. 6pm and 9pm. Prithvi Theatre, Janki Kutir, Juhu Church Road, Vile Parle-West (26149546). Tickets, Rs300. The ghostly voices of Indian soldiers interned in a prisoner of war camp in Germany make an appearance in an installation by film-maker Philip Scheffner and historian Britta Lange. The five-channel sound and video installation focuses on the thousands of Indian soldiers who travelled to Flanders and northern France to fight for the British, and were captured by the German army and housed in the Half Moon Camp in Wünsdorf, near Berlin. During their time in the camp from 1914-18, the soldiers were studied by German anthropologists and linguists, who sought to understand the languages and culture of people they saw as primitive. 11am-7pm (Tuesday-Saturday) 2-7pm (Mondays). Project 88, BMP Building, NA Sawant Marg, near Colaba Fire Station, Colaba (22810066). 10am-5pm (Sundays closed). Italian Embassy Cultural Centre, 50-E, Chandragupta Marg, Chanakyapuri (26871901). A choreo-installation by Diepiriye Kuku. The framework of Kuku’s piece is derived from singer Nina Simone’s haunting rendition of Pirate Jenny. Taken from one of the standout pieces of Brecht’s Marxist masterpiece, The Three Penny Opera, Simone’s vocals turn Kurt Weill’s melody into an anthem of liberation. 6.30pm. 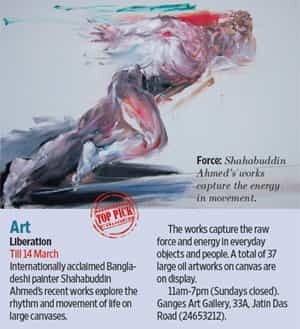 Abadi Art Space, F-213 A, First floor, Old MB Road, Lado Sarai (41078186). Suchismita and Debopriya Chatterjee’s parents were singers, but their father was so enamoured by the sound of the flute that he wanted his daughters to be flautists. It was an unusual and bold decision—there have been very few female flautists in Hindustani classical music. The fact that they lived in Allahabad helped their cause significantly and they have trained under Pandit Bholanath Prasanna. Subsequently, after moving to Mumbai, the sisters became disciples of Pandit Hariprasad Chaurasia. 7pm. India Habitat Centre, India Habitat Centre, Lodhi Road (43662009). The festival opens with readings from the Classics series—Kama Sutra by Vatsyayana (translated by A.N. Haksar), Zafarnama by Guru Gobind Singh (translated by Navtej Sarna), and The Selected Poetry of Amir Khusrau (translated by Paul Losensky and Sunil Sharma). Day 1 ends with a musical performance by Shubha Mudgal. On 13 March, Vishal Bhardwaj, director of 7 Khoon Maaf, and Ruskin Bond, author of Susanna’s Seven Husbands, on which the film is based, will discuss the story’s journey from the page to the screen. 5pm. Seva Sadan, 14th Cross, West Park Road, opposite MLA College, Malleswaram (23347830). At the turn of the 19th century, India was estimated to have around 45,000 tigers. The first tiger census of 1972 showed a headcount of just around 1,827. Conservation zoologist and tiger expert K. Ullas Karanth will talk about the issues affecting the survival of tigers in the country and the steps that can be taken through conservation to protect this species. 6.30pm. Bangalore International Centre, Teri Complex, 4th Main, 2nd Cross, Domlur, 2nd Stage (9886599675). A group show of works on textiles by artists Manish Nai, Rajesh Patil, Smriti Dixit and Sultana Hasan. A graduate of Mumbai’s LS Raheja School of Art, Nai’s abstract works have been based on raw and dyed jute and canvas, or jute pasted on butter or handmade paper, whereas Indore-based Patil often bases his works on spiritual themes drawn from the tribal cultures of India. Mumbai-based Dixit creates abstract mixed-media works based in traditional techniques of sewing, and the process of tangling and draping fabric. Hasan, who spent several years in Paris, presents figurative works of acrylic on canvas, fusing a sense of Parisian modernism with saturated colours and patterns that are distinctly Indian. 6.30pm. Girish Mancha, Bagh Bazaar. Tickets, Rs20, Rs30, Rs40 and Rs60. For details, call 9830042004. Artist Garima J.P. Singh is showcasing 18 of her figurative works, mostly in oil and a few in acrylic, at this exhibition. Her works are based on themes related to women, such as Meera Bai, Shakti and Kali. 11am-7pm. Chemould Art Gallery, Park Street, Park Mansion (22298641). Flurys presents traditional Russian food comprising soups, salads and stews made of fish and meat. Russians cuisine is usually sour and tangy, so it’s not surprising to find a predominance of pickled vegetables, sour cream, lemon juice and vinegar in the food. Popular dishes such as Borscht (a cabbage, beetroot and chicken soup), Kraboviy (rice and crab meat salad), Olivier (Russian salad), Kabachkovaya (Russian sliced marrow with sour cream and walnut dressing) and Pelmeni (chicken dumplings tossed in butter) are on the menu. Lunch starts at 1pm, the last call for dinner is at 9.45pm. Flurys, Park Street (40007453). Charges, Rs80-350 per dish. 2-8.30pm. Milan Mela Grounds, 3, JBS Haldane Avenue (2251 7513). Entry fee, Rs5.